Workers who assemble iPhones and iPads often put in more than 60 hours per week and sometimes work for a week straight in violation of Chinese law, according to the first independent labor audit of the Chinese factories where Apple products are made. The report released Thursday by the Washington-based Fair Labor Association says Hon Hai Precision Industry Co., the Taiwanese company that runs the factories, is committing to reducing weekly work time to the legal Chinese maximum of 49 hours. That limit is routinely ignored in factories throughout China. And the FLA found that many workers at the Hon Hai factories want to work even more overtime, so they can make more money. Hon Hai, also known as Foxconn, told the FLA that it will raise hourly salaries to compensate workers for the reduced hours. Auret van Heerden, the CEO of the FLA, said that it's common to find workers in developing countries looking for more overtime, rather than less. "They're often single, they're young, and there's not much to do, so frankly they'd just rather work and save,'' he said. Workers who make Apple products have been the subject of increasing scrutiny, in part due to a one-man Broadway play by Mike Daisey. Public radio program ``This American Life'' used Daisey's monologue in a show about Foxconn on Jan. 6, but retracted it two weeks ago, saying that Daisey had fabricated key parts of it, including that he saw underage workers emerging from Foxconn factories. The FLA didn't find instances of child or forced labor. Apple has kept a close watch on its suppliers for years, and in January took the further step of joining the FLA. The organization has audited overseas suppliers for fashion companies and other industries, but Apple was the first electronics company to join. It also commissioned the FLA to produce a special audit of Foxconn's factories. "Our team has been working for years to educate workers, improve conditions and make Apple's supply chain a model for the industry, which is why we asked the FLA to conduct these audits,'' Apple said in a statement. "We appreciate the work the FLA has done to assess conditions at Foxconn and we fully support their recommendations. We think empowering workers and helping them understand their rights is essential. Our team has been working for years to educate workers, improve conditions and make Apple's supply chain a model for the industry, which is why we asked the FLA to conduct these audits. We share the FLA's goal of improving lives and raising the bar for manufacturing companies everywhere." The FLA has its roots in a 1996 meeting of multinational companies and nonprofits convened by President Clinton, who challenged them to improve conditions for garment and shoe workers. Its 19-member board is composed equally of representatives from member companies, universities and nonprofits like the Global Fairness Initiative. The organization is funded by participating companies. Labor unions have criticized Apple's use of the FLA, insisting that audits are a ``top-down'' approach. Foxconn's workers would be better served, they believe, by being able to organize. ``The report will include new promises by Apple that stand to be just as empty as the ones made over the past 5 years,'' said SumOfUS.org, a coalition of trade unions and consumer groups, ahead of the release of the report. Apple CEO Tim Cook visited a Foxconn factory in Zhengzhou, China, on Wednesday. In February and March, FLA auditors visited three Foxconn complexes: Guanlan and Longhua near the coastal manufacturing hub of Shenzhen, and Chengdu in the inland province of Sichuan. They employ a total of 178,000 workers. The auditors examined one years' worth of payroll and time records at each factory, conducted interviews with some workers and had 35,000 fill out anonymous surveys. The FLA found few safety violations, noting that the company had already dealt with problems like blocked fire exits and defective protective gear. It's also taken step to reduce the amount of aluminum dust in the air, after the metal created an explosion at the Chengdu factory last year, killing four workers. The FLA said Foxconn has been recording only accidents that caused work stoppage, but is now committing to recording and addressing all accidents that result in an injury. Heerden said his auditors found that Foxconn workers are the happiest with their jobs when they work 52 hours a week, well below the amount they often put in. Reducing their hours to 49 hours should help Foxconn retain workers in the long run, he said. Apple's and FLA's own guidelines call for work weeks of 60 hours or less. Apple has started tracking the working hours of half a million workers in its supply chain, and said that 89 percent of them worked 60 hours or less in February, even though the company was ramping up production of the new iPad. Workers averaged 48 hours per week. 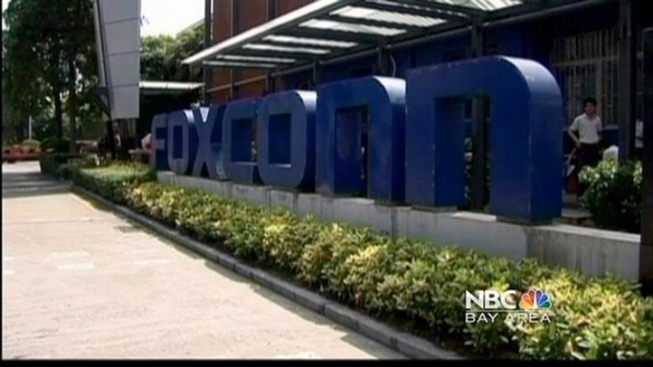 The Foxconn factories are the last step in the process of manufacturing an iPhone or other Apple device, most of which have hundreds of components. Research firm IHS iSuppli estimates that Apple pays $8 for the assembly of a 16-gigabyte iPhone 4S and $188 for its components. It sells the phone wholesale for about $600 to phone companies, who then subsidize it to be able to sell it for $200 with a two-year service contract.